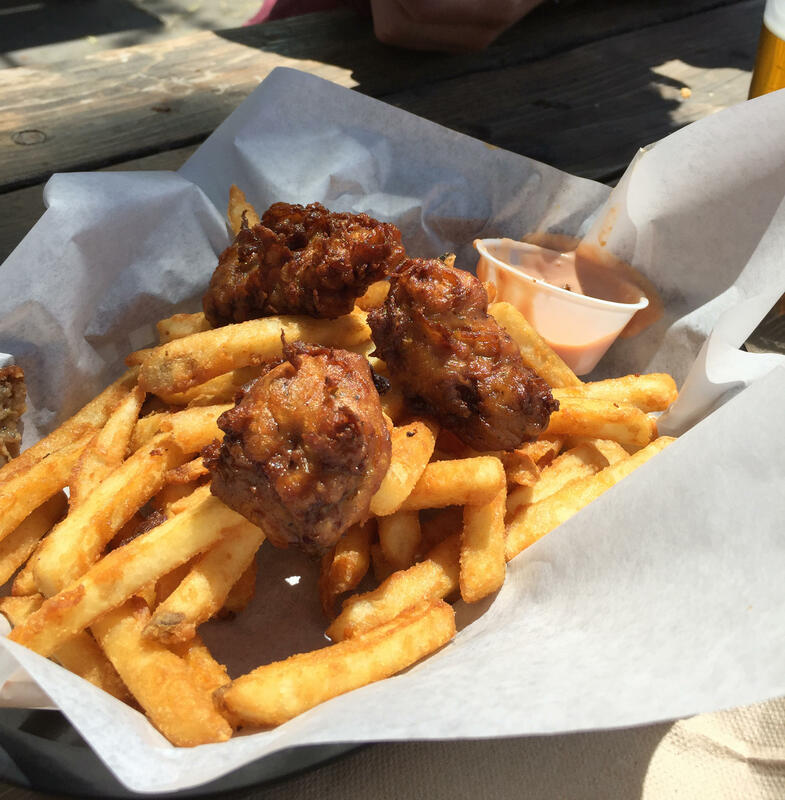 Kris Komori and Kevin Huelsmann can hardly wait to dive in to the basket of finger steaks at fries at the Dutch Goose. Lindy's on Chinden was the first stop on our finger steak tasting tour. Our second finger steak serving happened here at the Dutch Goose. We rounded off the tasting tour at the Westside Drive In on State Street. I’m sitting at State and Lemp with two fellow finger steak neophytes who are also skilled cooks. For the uninitiated, finger steaks are basically chicken nuggets -- but steak. As the three of us chat and get preliminaries out of the way, we discover none of us are from Idaho. I got here under a year ago from California. Sitting next to me at the big communal table in the restaurant is head chef Kris Komori. He claims something of partial resident status since he’s not from the Gem State originally, but arrived here to go to school at the College of Idaho. Across from Kris is State and Lemp’s sous chef, Kevin Huelsmann. Before getting into the world of cooking and food, Kevin was a journalist in Montana. However, he’s not from Big Sky Country. “I grew up in St. Louis, originally,” he tells us. We’re on the hunt – not for the best finger steaks per se, but we’re looking to see what the spectrum of fried red meat has to offer. Although none of us have ever had the treat, a team of chefs seem like the perfect companions for sampling a food item that wouldn’t be out of place on a fair’s midway. 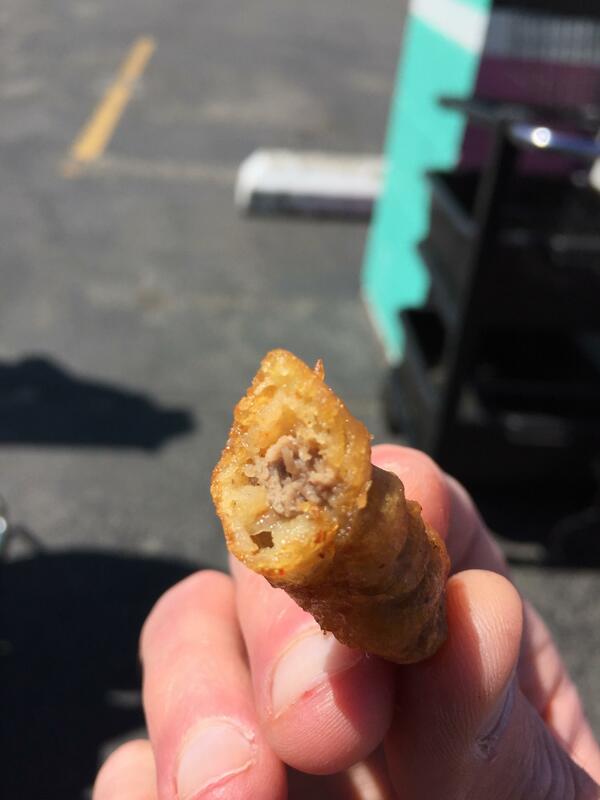 Behold: The finger steak, a revered Idaho "must-eat." 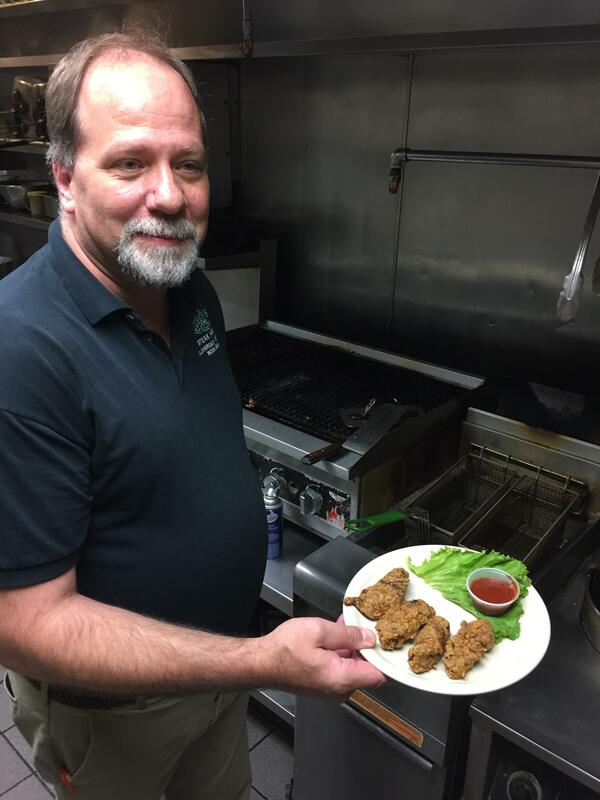 Even though we’re new to finger steaks, Kevin, the sous chef, mentions something we – and probably anyone who’s ever heard of them, knows. “Everybody mentions they were created at The Torch, or what is now The Torch,” he says. Sadly, Milo’s Torch Café is no more. But with the fabled history of finger steaks in mind, we set off to try the Idaho delicacy at Lindy’s Steak House in west Boise, the first of three places. When we arrive at the restaurant off Chinden near the HP campus, Bob Tinker, the general manager at Lindy’s, is expecting us. Tinker told me his finger steaks were different from the norm – what does he do different? Tinker says his finger steak is rooted in the high bar he sets for the product. With that, he leads us back into the kitchen where the magic happens. The first thing he does is show the three of us Lindy’s high pressure deep fat fryer. He takes a large piece of steak and cuts it into four hearty slices. He puts a little fresh garlic on the slices, quickly dips them in water, and douses the strips of meat in a special, seasoned flour mixed just for Lindy’s. Once breaded, he throws them into hot oil in the deep fryer, closes the lid and sets the timer for two-and-a-half minutes. When quite possibly the longest one hundred and fifty seconds I’ve ever had to wait passes, Tinker plucks deep golden brown finger steaks from the oil and plates them. The finger steaks at Lindy's are breaded, not battered. And Bob Tinker uses a high pressure deep fat fryer to cook them. We head back to the front of the house and it’s Kris, the head chef, who’s the first to dig in. “It’s good – it’s really good,” he says, smiling with a mouthful of the meaty treat. I take a bite of the hefty finger steak. It’s piping hot, juicy and crispy – like the perfect bite of fried chicken, but steak. The meat inside the breading is tender and still a little pink in the center. Tinker tells us the steaks come out of the fryer perfectly cooked between medium rare and medium. Each us put one of the big finger steaks away – the fourth is split between Kris and Kevin. We thank Bob Tinker for the wonderful introduction to the Idaho staple and head out. Before getting in the car to head to our next stop, we do a quick debrief on Lindy’s. The general consensus: They’re going to be hard to beat. “I like how much pride they take in it. It was good,” says Kevin. That sentiment is echoed by Kris. “It felt more like steak cooked to temp – just kind of like a normal process – instead of what you think of as scraps being fried to hell,” says Kevin. From Lindy’s, it’s off to the Dutch Goose. Since we arrive in the mid-afternoon, we have the place to ourselves. Beers in hand and finger steaks ordered, we head out to the patio. Only a minute or so after sitting down, a voice on a loudspeaker announces our order is ready. Dutch Goose finger steaks – which are more nugget than finger shaped – come on a bed of golden fries with a little tub of fry sauce for dipping, all neatly served in a plastic basket. The fry sauce at the Dutch Goose really adds to their finger steak experience. When I reach for the nugget of steak, most of the coating falls off, leaving a chewy piece of meat between my fingers. This isn’t necessarily a bad thing, because when I go to dip it in the fry sauce, a bit extra gets on my fingers and accompanies the bite. The three of us decide the standout feature of the Dutch Goose finger steak isn’t the steak itself but the fry sauce that has a nice kick of horseradish to it. In short, it’s solid bar food. “Plastic basket, parchment and brown. That’s what I was looking for,” says Kris. After lingering on the patio for a while longer and taking in the sunny afternoon, we head to our final stop, the Westside Drive-In on State Street. Sitting under an umbrella in front of the neon pink and turquoise diner, we take in Westside’s presentation of the dish. Kevin describes what’s in front of us as a party platter, whereas Kris opts for the more old school pu-pu platter designation. Kris notes that Westside gives customers both of the traditional finger steak condiments: cocktail sauce and fry sauce. Each of is impressed by the spread of food: finger steaks gently resting on a bed of gems (i.e. tater tots), a thick slice of garlic bread resting on top of the finger steaks and a fortune cookie tossed in the basket for good measure. 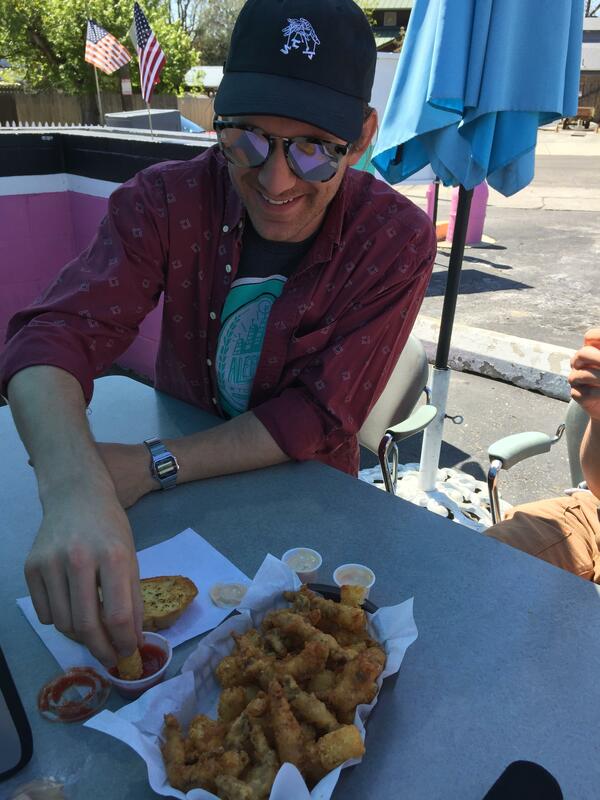 Kevin was the first to brave the cocktail sauce Westside Drive In serves with their finger steaks. Making our way through the platter, we agree Westside’s finger steaks are the closest to what we imagined them being before having them. The ratio of coating to meat is skewed slightly in favor of coating, and these are by far the most finger-looking of the variety we’ve tried. With the mission complete – and as we digest – I asked my compatriots if they felt like they now understand finger steaks. After a long afternoon of fried food, Kris says what we’re all thinking.